This isn’t a blockbuster post, just a simple story that illustrates how frugality runs through many aspects of our life. When I was young, my father always had a giant garden. One vegetable that he always grew every year was cucumbers. They always seemed very easy to grow compared to the other vegetables in the garden – they practically grew themselves if you gave them plenty of water and sunshine. 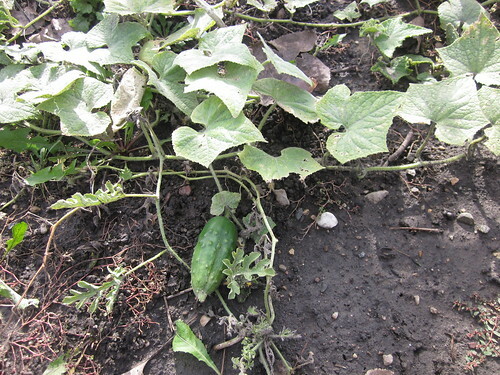 Plus, we often ate the cucumbers in various ways as they came to harvest. Flash forward to my current home, where we’ve had a garden each year. Cucumbers have always been a staple in our garden, but in previous years, we’ve had a much wider variety of vegetables and the cucumbers have been relegated to a small spot. This year, though, the birth of our third child coincided with the key part of planting season, which meant that we focused heavily on the “easy” things in the garden this year. The cucumbers, unsurprisingly, were part of this, so we planted quite a few more cucumber plants than normal. Of course, they produced like mad, giving us tons of cucumbers to use. We’ve used them in lots of ways, such as salad toppings and side dishes. We simply have had plenty of fresh pickles in August and September this year thanks to those easy-to-grow cucumber vines, and the jar depicted above shows one of our recent batches where we used a package of pickling spices. However, our usual recipe is even simpler than that. 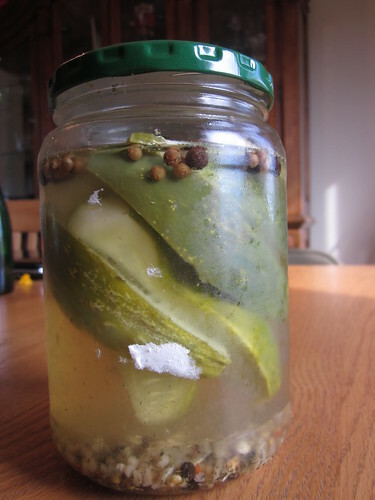 All you do is slice up two or three small cucumbers and put them into whatever lidded jar you have available. Put some dill seed and a bit of minced garlic in there, too (a teaspoon or two of each). Then, in a saucepan, boil together 1/2 cup vinegar, 2 cups of water, and 1/2 tablespoon of salt (get it to boiling for about a minute or so). Pour this mix over the cucumbers until the jar is full, put it in the fridge without a lid for a few hours, then put a lid on top of it. That’s all – just wait a few days and you’ll have tremendous pickles. This saves us money in a lot of ways. First, this jar of pickles is fresher, better tasting, and far less expensive than a jar of pickles from the store. The cost of half of a cup of vinegar, half of a tablespoon of salt, and a tiny bit of minced garlic and dill adds up to a few pennies. A jar of good pickles at the store is a few dollars (at least). Our homemade pickles are far fresher and taste better, too. Second, we’re able to effectively use something we have an abundance of – cucumbers. Rather than letting them go to waste, we’re simply finding different uses for them. Cucumbers are just the start – we look for other uses for virtually everything in our home. Third, because we now have a lot of pickles, we consume them instead of other options. We serve them with sandwiches, with chili, and often as an afternoon snack. Our children often take queues from their parents’ eating behaviors, so if we eat and enjoy particular foods (and don’t give them other options), they’ll eat and enjoy them, too. It also teaches our children a lot about living frugally. They’re a part of this, too – they’re out in the garden with us, they watch us making the pickles in the kitchen, and they enjoy the product of the process, too. Frugality isn’t something you flip on like a switch, then flip off when you want to be a big spender. It’s how you approach life, from the little things to the big.